Does your dog seem sad? Could your dog be depressed? Do dogs even get depressed? Like humans, some dogs can occasionally suffer from bouts of depression. Although dogs do not have the same capacity for reasoning as we humans, it doesn't mean they cannot experience depression. In dogs, depression is not exactly the same complex clinical disorder that it is in people. However, dogs can certainly experience depression. When dogs are depressed, they often appear sad, lethargic, and withdrawn. Some dogs will stop eating or eat much less than usual. They may drink only minimal amounts of water and lose interest in play. Eventually, some depressed dogs can lose drastic amounts of weight and develop a variety of physical illnesses. As a loving dog owner, you will be relieved to learn that you can actually help your dog. As a pet owner, how do you fight an invisible, inner enemy? The first step is recognizing the problem. There are several potential causes of depression in dogs. Physical Illness: Many health problems will cause dogs to act depressed. Contact your veterinarian right away if you notice signs of depression in your dog. It is important to first rule out a physical cause for your dog's abnormal behavior before things get worse. If your vet does find a health problem, follow the treatment recommendations. Hopefully, your dog's depression will improve once he recovers from the illness. If not, or if your vet has ruled out all the possible physical causes of depression, it is time to start looking at mental/emotional reasons. Grief: Dogs mourn the loss of human and animal companions just as you do. Perhaps a housemate or neighborhood dog he played with is gone (vacation, moved away, died). Or, maybe a child in your home has grown up and moved out. There is no way to explain this to your dog. Losing a playmate, especially an in-home playmate is often a reason for canine depression. We may not notice it very often, but pets definitely do grieve. 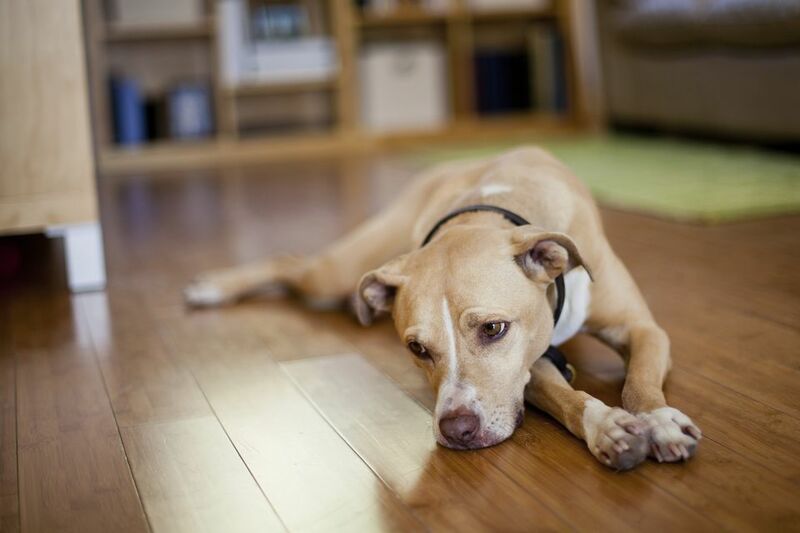 Environmental Changes: Moving to a new home, a general change of scenery (like a renovation), or even the weather can adversely affect a normal happy dog. You can't explain the reasons for such a dramatic change. It usually takes time for your dog to adjust to major environmental changes. You (the owner): Are you depressed or sick? Your dog will be able to pick up on your energy and may begin to feel similar to how you feel. Or, your dog might be depressed if you are gone a lot. This may be similar to separation anxiety (but instead of "acting out" your dog gets depressed). Unknown: In some cases, there is no known reason for the depression. This can be very frustrating for you as an owner. Slow deterioration and loss of initiative are definite clues that something is bothering your dog. If this is happening to your dog, you need to address it right away and start to make life fun again. Once you have ruled out a health problem, an increase in your dog's activity level is the next step to helping your dog. Exercising with your dog is a wonderful way to begin. Try to engage in fun activities with your dog, like games, fun tricks, and general training. Take some time to bond with your dog. You may also consider letting your dog play with other dogs or go to doggie daycare. It's natural that you will want to pay more attention to your dog when he is depressed. This is not inherently bad, but do try not to coddle or overly comfort your dog. Too much coddling and comforting on your part may actually reinforce the sad behavior. It is very important to try your best to stay on schedule and stick to your normal routine. This can give your dog a sense of security and boost his confidence. If the timing is right for your family, you may consider getting another dog. This may be helpful if your dog is depressed because of losing a companion. However, this could make things worse if your current dog does not accept the new dog. Proceed carefully. If none of these activities seem to be helping, your vet may still be able to help. Medications are sometimes thought of as a last resort, but there are cases when they are the best option. Some vets will prescribe a drug like fluoxetine (Prozac) though this is not right for all dogs. You may also consider seeking the help of an animal behaviorist. You may not think depression is a big problem. While is true that it often resolves on its own after a short time, there are times when it only gets worse. If left too long, it could very well turn into a life-threatening physical condition. Get help with your dog's depression as soon as you can. Remember that the right place to begin is with your veterinarian.